Magnetic Resonance Imaging (MRI) is among the most important medical imaging techniques available today. There is an installed base of approximately 15,000 MRI scanners worldwide. Each of these scanners is capable of running many different "pulse sequences", which are governed by physics and engineering principles, and implemented by software programs that control the MRI hardware. To utilize an MRI scanner to the fullest extent, a conceptual understanding of its pulse sequences is crucial. 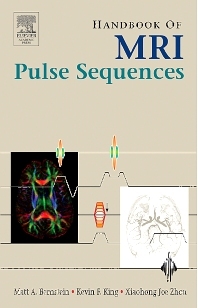 Handbook of MRI Pulse Sequences offers a complete guide that can help the scientists, engineers, clinicians, and technologists in the field of MRI understand and better employ their scanner. Researchers and clinicians in radiology, chemistry, biochemistry, pathology, psychology, neurology, and oncology who use Magnetic Resonance Imaging (MRI). Part I: Background; Introduction. Part II: RF Pulses; RF Pulse Shapes; Basic RF Pulse Functions; Spectral RF Pulses; Spatial RF Pulses; Adiabatic RF Pulses. Part III: Gradients; Gradient Lobe Shapes; Imaging Gradients; Motion Sensitizing Gradients; Correction Gradients. Part IV: Data Acquisition, K-Space Sampling, and Image Reconstruction; Signal Acquisition and K-Space Sampling; Basics of Physiologica Gating, Triggering, and Monitoring; Common Image Reconstruction Techniques. Part V: Pulse Sequences; Basic Pulse Sequences; Angiographic Pulse Sequences; Echo Train Pulse Sequences; Advanced Pulse Sequence Techniques. Consultant, Department of Radiology, Mayo Clinic, and Associate Professor, Mayo Clinic College of Medicine, Rochester, MN, U.S.A.
Senior Scientist, Global Applied Science Lab, GE Healthcare, Milwaukee, WI, U.S.A. Associate Professor, University of Illinois Medical Center, Chicago, IL, U.S.A.